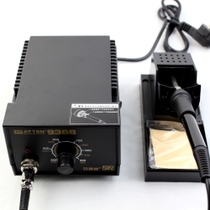 ● The whole soldering station using a conductive material, designed to prevent static electricity and clean room environments (ESD) has this feature. ● temperature heating element made ​​of imported materials made ​​with advanced technology, long life. ● heating element using low voltage AC power source, ensuring anti-static, no leakage, no interference. ● setting and control 200 ~ 480 ℃ temperature stable and accurate. ● handle special lightweight, long-term use without fatigue. ● heating element is completely isolated by the main power grid. ● iron part in anti-static air connectors and high temperature silicone rubber (silicone) cable with temperature control units connected. ● Unique temperature locking device to prevent staff hackneyed temperature. ● split design, display easy. 3 electronics repair industry overhaul. 4 all enterprises electrician soldering operation. 5 electronics enthusiasts for electronic assembly. ● 200 ℃ temperature control knob to the position. ● Connect the iron and console. ● turn on the switch, the power indicator LED that lights up. ● temperature control knob to the suitable temperature location.